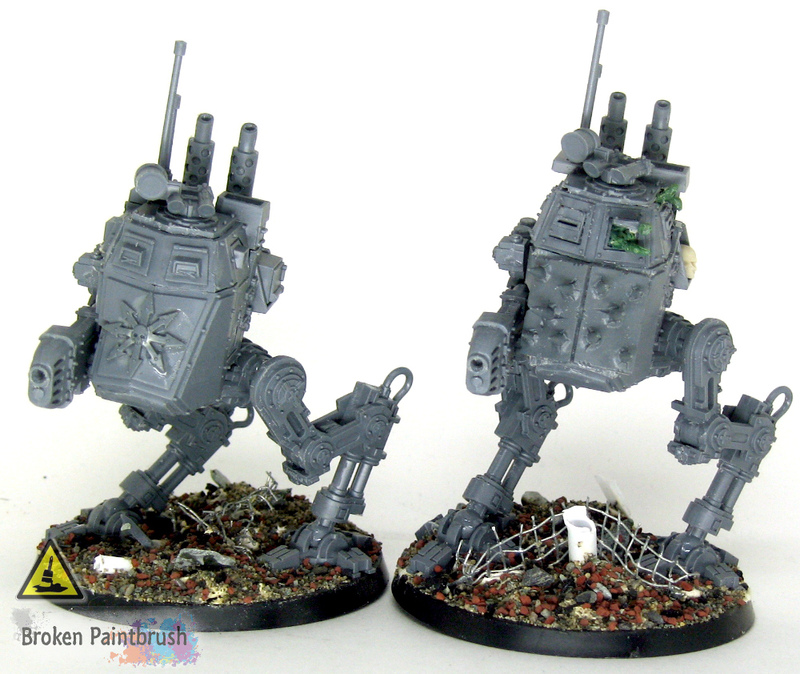 I admit it, I’m a tread head and a star wars geek, so when I was building up my Traitor Guard, not only did I fill it with a bunch of tanks, but had to add at least a couple of Sentinels. 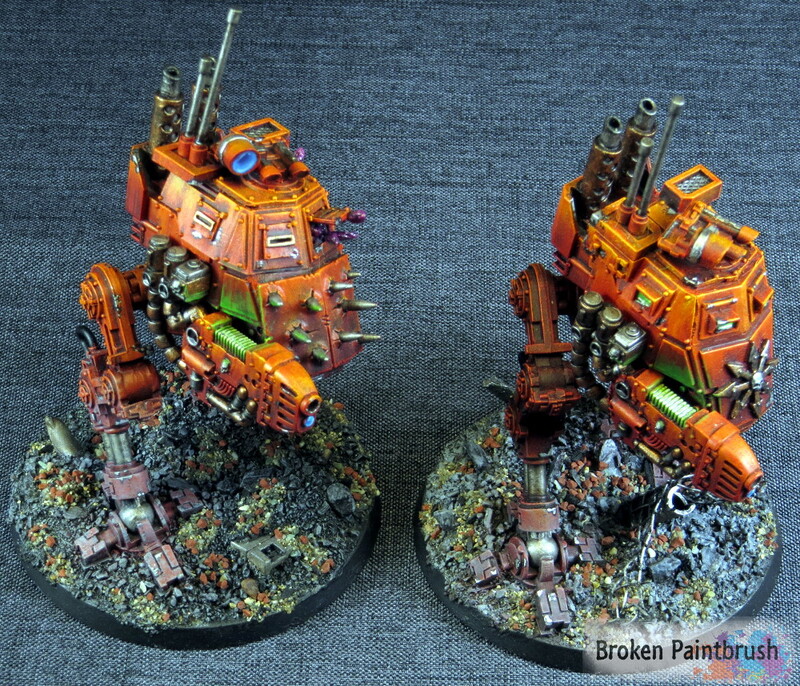 So here is my Traitor Guard Armored Sentinel squad armed with plasma cannons. I built up the bases using extra bits and sprue then filled in the bumps with plaster with a final layer of gravel on top. Conversions were fairly simple. The eagles on the front were cut off, and a chaos star was bent around the front of one and two Chaos Vehicle plates were added to the front of the other. With a bit of green stuff, I also added a bit of demonic presence to the one. With a bit of green stuff, I also added a bit of demonic presence to the one. 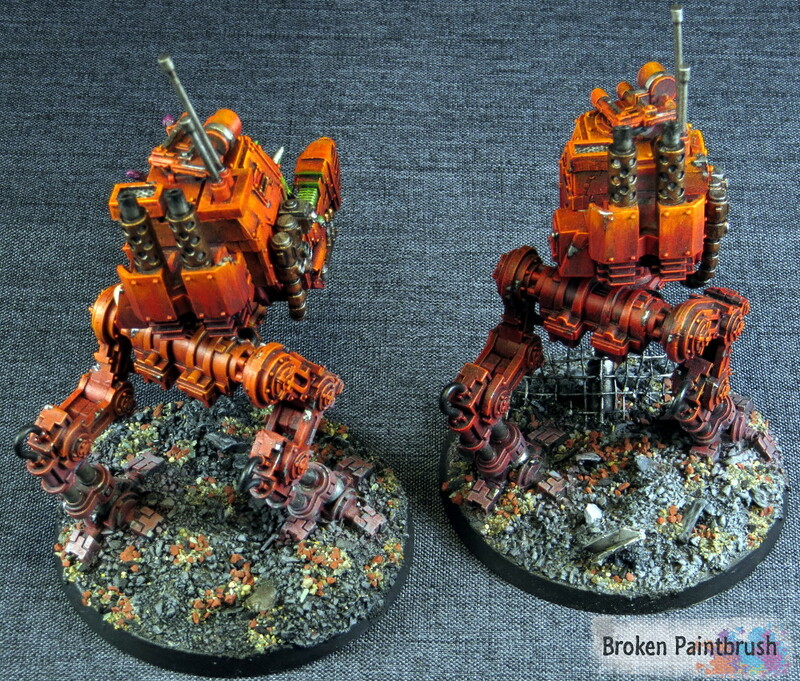 Since sentinels are a bit taller than the tanks, the orange to red transition was a bit longer and by the time it got to the feet, they were pretty dark red. To give them some definition I dusted the edges with the layer coats of the base for weathering. I also magnetized the weapons, but in hindsite, it was a silly thing to do since the plasma glow was spread onto the actual hull – can’t really magnetize that. 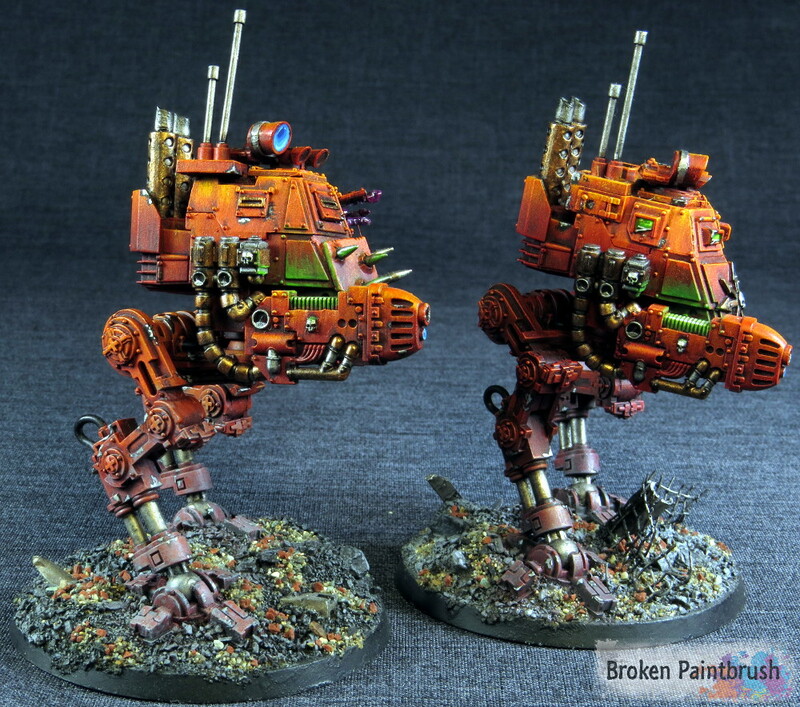 While the sentinels in games have always been a bit unpractical, I love the aggressive stance and look of the armored sentinels striding forward. I think because of this they often became an early target in games – sometimes more so than the bigger tanks. Something about two angry looking plasma cannons – even if BS3 means they will often veer way off target more times than not. 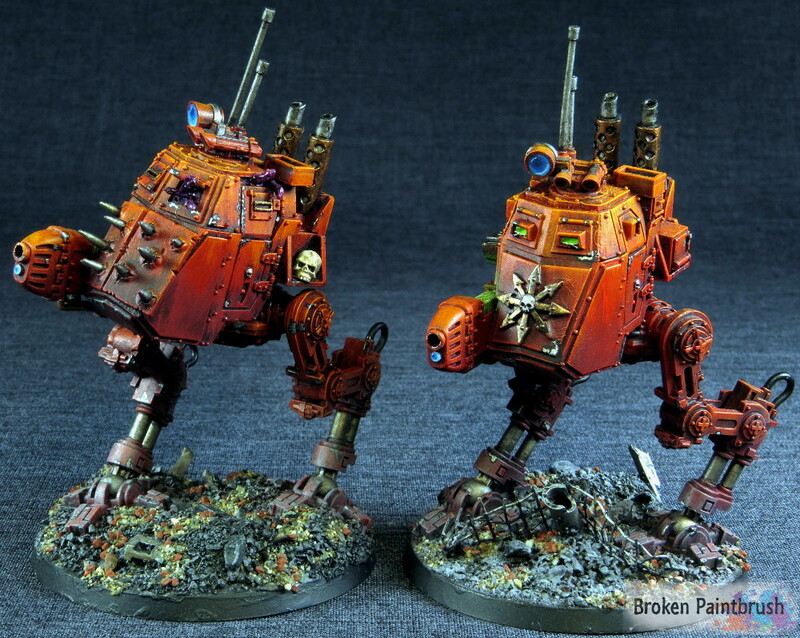 Let me know what you guys think of my Traitor Guard Armored sentinels in the comments below. You can see more of the army at the Traitor Guard Army Page.